Louis C.K. on Race: So I guess we’re even? 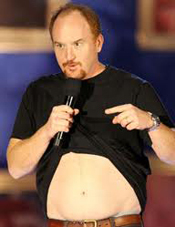 Comedian Louis C.K. has joked about race and privilege for years. Here on a 2010 Tonight Show appearance, he does a great reprise of his basic white privilege bit—especially starting at about the 8:30 mark in this 12-minute segment, even though Jay Leno tries to steer him off the subject with some inane questions. Some time later UpWorthy.com uploaded this bit again, giving it the title “Sometimes It Takes a White Dude to Get Real About Racism.” But there’s absolutely nothing more “real” about C.K.’s take on racism and white privilege than the mountains of “real” expressions on racism and privilege that have come from people of color for centuries. It’s just that our expressions don’t carry as much weight. That’s one measure of how systemic racism is, how a cultural system turns some voices lower and some higher. I like the way C.K. speaks about racism, and I’m thankful, but people of color do wish we could speak for ourselves sometimes and be heard around half as much. People of color also wish we could be heard without that “Oh-they’re-whining-again” dismissive smirk that C.K. never has to suffer. (C.K. is half Mexican, I understand, though his looks conceal this completely, a situation which has given him unusual access to racist behavior.) In the moment, you can just laugh. But for laughter and pain and analysis rolled into one, try Richard Pryor some time. Maybe you don’t laugh quite as hard—maybe—but he leaves you with the ache of pain caused by racism, and that lasts a long time after the aches of laughter leave. It’s really real. Our cultural system allows us to put crazy equal and un-equal signs everywhere. Here’s an example I use all the time: In my state, Illinois, less than 1% of white students go to chronically failing schools, while nearly 40% of black students do. (Go HERE to read more.) This 40 to 1 advantage makes it far, far less likely that a black student will get into college, but many white students will point to that one case of preferential treatment—I don’t deny things like this exist—as if it things were now even…or worse: as if that one case were actually something to get as enraged about as the tens of thousands of cases where a student of color never even gets a chance. Afterall, it’s America—Oh Beautiful for Level Playing Fields—where everyone’s equal, everyone has the same chance. Here’s another short YouTube video focused on another aspect of C.K.’s privilege bit. This one focuses on time travel. He says as a white person he could go back anywhere in time and feel comfortable, but he fears for the future. (Sensitive watchers should beware of a very crude image at this point.) I don’t know, C.K. Sometimes progress seems so slow—notwithstanding our first black President—that I think you’ll be able to feel comfortable for decades into the future. The educational disparity mentioned above would be a great addition to Louis C.K.’s privilege bit, as would a long list of other absolutely stunning disparities in health, wealth, opportunities, and virtually every other aspect in life. Louis, if you’re listening, please speak for us! Seems like we can’t be real without you. ♦ Go to the TEACHING DIVERSITY main page. This entry was posted in Diversity & Multiculturalism, Social Change and tagged Louis C.K., racism, Richard Pryor, white privilege. Bookmark the permalink.